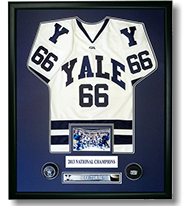 Varsity Athletic is the nations largest supplier of framed awards to over 600 Collegiate athletic departments nationwide. 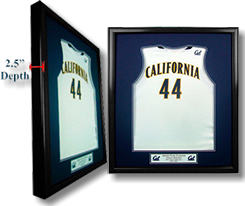 Our distinctive USA made solid hardwood framed jerseys have an industry leading 2.5" frame depth which gives the jersey an expansive, deep "Shadowbox" look. Our unique jersey frame construction allows your jersey to be sandwiched in between two mat-boards which creates the optical illusion of the jersey "floating" inside the frame. 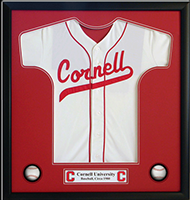 Yet we can also frame your jersey in a traditional open box format. 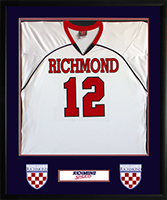 "Without a doubt, Varsity Athletic Apparel is one of the best in the jersey framing business. They offered a competitive price and turnaround time without sacrificing the quality of the product." 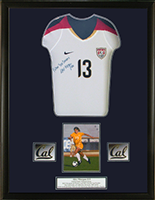 "The framed jerseys they create are professional and classy. We used the jerseys for a senior night gift, and our seniors were blown away. 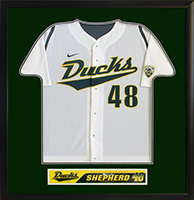 Varsity Athletic Apparel/MVP Frames allow for customization that fit our every need."